Q. Hi I am trying to put an ad for teachers for my school in Bihar and need some clarifications. This complimentary translation service that you are providing means in my ad will also be published in Malayalam in the Malayalam edition of Mathrubhumi right? Which heading, category and sub category should I choose? Why place Recruitment Ad in Mathrubhumi Newspaper ? You can use our online ad booking portal to successfully book your ads on Mathrubhumi’s Recruitment section in 10 mins. 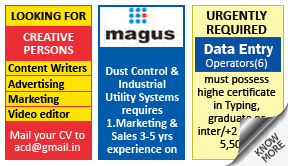 A large section of Mathrubhumi’s active readership regularly check the recruitment ads section. Recruitment ads are released by companies who are looking to hire new employees, and these ads usually comprise the basic educational qualifications one needs to apply, the job role to be offered, and contact details. Some ads list a number of skills applicants need to possess, along with a few details about the job such as if it would require travelling, or if aspirants need to possess a vehicle to apply for the job. 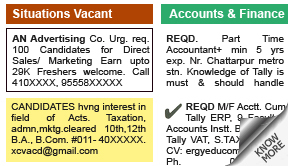 How To Book Recruitment Ad in Mathrubhumi Newspaper ?